Private Daniel Henry Hanley was the eldest son of Arthur Hanley and Alice Buckley born in Adelaide on 2 May 1897. Hanley was employed as a labourer when he enlisted on 26 January 1915 aged 18 years and 9 months old. Initially part of the 27th Battalion, Hanley embarked from Adelaide on 31 May 1915 on the HMAT Geelong A2 and then from Melbourne on 26 November 1915 on HMAT Commonwealth A73. In February 1916 Hanley was transferred to the 7th Reinforcement of the 24th Battalion. His last post was in the 10th Australian Infantry Battalion serving in France. The packet contains a graphic eyewitness account from a soldier, who called him a ‘very old pal of mine’, detailing what occurred to Hanley on the battlefield during his last days. 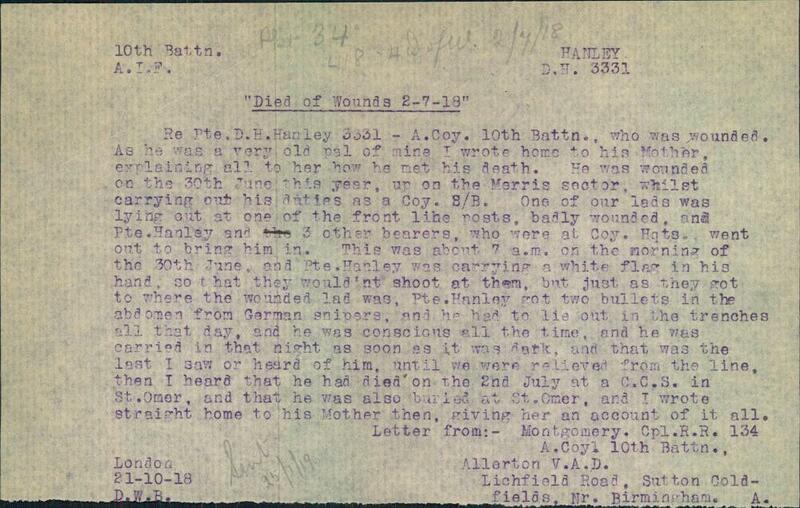 On 30 June 1918 Hanley and three other men where sent out to the field, during daylight, to bring in a badly wounded soldier who was lying at one of the front line posts in the Merris Sector. Hanley carried a white flag in his hand, with the belief that this would ensure enemy soldiers would not shoot at him or the others. However, when the four men arrived to tend the wounded soldier and take him back to the trench, a German sniper shot Hanley in the abdomen ‘dangerously’ wounding him. A second rescue crew was sent during nightfall to retrieve Hanley and the other solider. Hanley, badly wounded, had remained conscious for the entire day lying in the field. His mates in the trench were aware that he was seriously wounded, but alive and awake. Hanley was taken to a Regimental Aid Post behind the Merris Sector and the following day transported to a hospital. Upon arrival his condition was described as ‘hopeless’. He died from his wounds, aged 21, the following day on 2 July 1918. Hanley is buried at the Longuenesse (St Omer) Souvenir Cemetery. No one knows the silent heartache.